If confirmed, Marie Royce will be tasked with leading the State Department’s exchange programmes, including J-1 exchanges. Royce impressed with the strong bipartisan support for J-1 exchanges, promised transparency and collaboration with Congress. Royce is an ACYPL exchange alumna. The Alliance for International Exchange released a statement of support following Royce’s nomination in January. Following the confirmation hearing, Mark Overmann, Vice President of External Affairs at InterExchange, shared his perspectives of Marie Royce and her background. “Calling herself a passionate champion of people-to-people exchanges, Marie Royce pledged to strengthen and improve Department of State exchange programmes and work closely with Congress to support the J-1 Exchange Visitor Program (EVP). 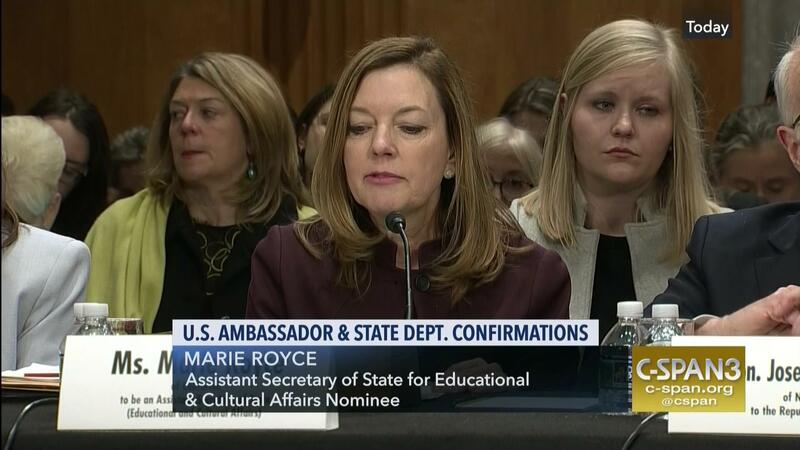 Department of State exchange programmes provide participants ‘real world experiences in the U.S. that foster credibility and trust,’ Royce said during her confirmation hearing last Wednesday to be Assistant Secretary of the Bureau of Educational and Cultural Affairs (ECA). If confirmed as Assistant Secretary, Royce will lead the State Department’s exchange programmes, including the J-1 EVP.